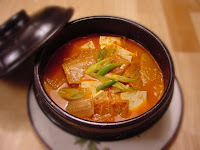 This here photograph is of kimchi jigae, one of my favourite Korean dishes. It looks delicious, doesn't it? Even so, I wouldn't be surprised to learn that you're wondering what it's doing here, on a book blog. The sad fact is, I couldn't find any photos of the book I just finished reading, The Waves by Kang Shin-jae, on the interwebs. I also couldn't find a larger than hyper-minuscule photo of the author and the Korean flag .jpg I tried to download crashed my computer so kimchi jigae it is for this post's pretty picture. When I happened upon Kang Shin-jae's The Waves I was really pleased and it's taken me only about 2 months to get to it - which constitutes lightning speed in my book queue. This novel covers a year in the life of Young-sil, a gossipy teenage harridan, in rural Korea; the narrative is linear but more episodic than sustained story-telling, which isn't a bad thing, although I do love me sustained story-telling. Dear lord, who wrote this? This is the kind of thing that, especially that final sentence, I had to continually remind my uni students not to begin their essays with, you know, the "Since the beginning of time..." opener. "Since the beginning of time, love has been confusing and difficult. In Shakespeare's Hamlet, Hamlet and Ophelia share a set of confusing and difficult emotions which only they understand, which leads to their downfall." No, that's not a real essay introduction - I wrote it myself and it made me sad because I've read too many things too similar to it. Anyway, The Waves, besides being uneven was plagued with a bevy, a horde, an embarrassment of typos - which I find distracting beyond description. Verdict: this book was uneven, as symbolized by waves, as they crest and then crash, always going up in great power and then breaking apart in defeat. Damn you, Kang, and your too frequent explanations of your own elementary school symbolism!! I'll check out Memories of My Ghost Brother - thanks for the recommendation!